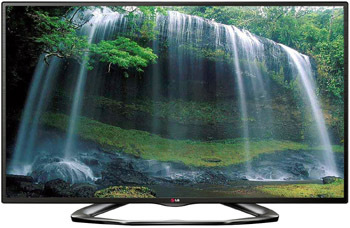 The LG 50LA6200 is one of the first 50” LED TVs LG has produced. The 50 inch size is usually dominated by plasma TVs and so it's obvious right off the bat that LG is wanting to compete with plasma with this offering. To do so, the unit forgoes the top end Cinema Screen design feature of top LG models, but it is nevertheless attractive. It also does not have the Magic Remote included with the TV though it is optional. This makes the LA6200 a top value piece for LG for 2013/2014 and it's lower price is what allows it to compete with those very economical plasma TVs. It would be nice if there were a control directly to this setting on the remote control. This is possibly going to be the control you will most want to access and play around with to find out what is most desirable for you. Purists will likely need to turn this feature Off for film and normal content, but it may assist in watching live sports and 3D. All of the TruMotion options diminish natural background blur and add a kitchy soap opera effect to programming. Although the De-Blur portion of the settings only has a minimal impact we recommend setting as follows. Then use the Smooth setting for sports or 3D. This is a weakness of this the LA6200 just as it is with most LED TVs. Some do a better job than others. At 25 degrees off center there is notable contrast loss and this is especially noticeable if you are viewing the TV from above or below eye level. For instance, you would be affected by this loss of color and contrast if you had the TV mounted above a fireplace. We tested the LA6200's passive 3D vs. some other active 3Ds and we are now converts to passive. We think it's better and the glasses are certainly light, cheap and comfortable. If you're a 3D nut, LG's passive 3Ds cant be beaten. Unfortuntely, we could not test the 3D content located through the TVs Smart menu very well due to lack of processor power in the TV. But with BluRay 3D content the TV displayed a great amount of depth, rich colors, and good contrast. The TruMotion setting in Smooth or Standard is good. First, make sure the TruMotion feature is on (Standard picture with Smooth TruMotion setting is fine). With a push of the 3D button on the Magic remote control you can convert any 2D programming you are watching to 3D. Obviously LG is keen on everyone trying this – thus the dedicated key on the remote. We tried out the 2D to 3D conversion much more extensively with a couple of Blu-Ray discs. The 3D effects are fairly subtle with the conversion – pretty good, but we still preferred a BluRay without the 2D to 3D conversion. Side angle viewing quality is affected severely with 2D to 3D conversion with contrast and colors fading. Normal DVDs may be brought to life, especially older ones by the conversion to 3D. Give it a try. The LG 50LA6200 has a dedicated picture preset for gaming. This is unique compared to a lot of other brands because it is easy to find. This is a plus. In this picture mode, the input lag is significantly cut down. Our testing results show around 30ms. This is a perfectly acceptable result for action games and first person shooters. The motion blur and judder really increase in the Gaming picture setting. This is where the LA6200 loses marks for gaming. This is an optional accessory for the LA6200 and we recommend it. It costs around $100 but if you will be utilizing the Smart TV features and web browsing a lot on this unit then it's worth it. And your saving a lot of money on this TV from the unit above, the LA6900 so go ahead and splurge because the Magic Remote is one of the only “value added features” that we recommend. It's easy to use and get used to and it speeds up Internet browsing considerably from a normal 5-way controller keypad. The voice recognition feature works astoundingly well. To see our full review of the Magic Remote refer to the LG 55LA7400 review. 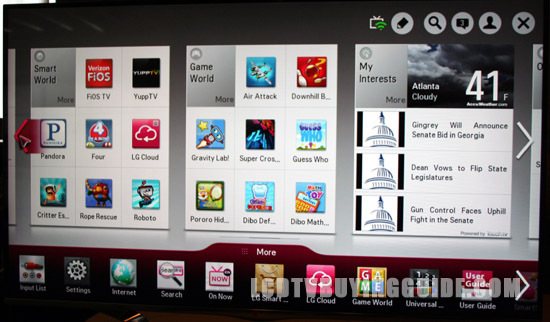 The 50LA6200 is loaded with Smart TV features not found in previously in LG TVs. The experience of the user has been granted the most attention when designing the Smart TV platform. The familiar Smart TV suite is in place with some enhancements over past iterations. The first new thing you'll notice is the “My Interest Cards” placed on the home dashboard. These allow you to customize the easily accessed apps and display things like real time weather or news from your favorite sites. Smart Share features are one of the biggest updates to Smart TV. The LG 50LA6200 is capable of accepting a Wifi signal from a portable device which lets you display 5.1 surround sound full HD content without and wires. Near Field Communication (NFC) is supported as well. LG has named this the "Tag On" feature. All you have to do is hold a NFC device near the NFC sticker that comes with the TV and video or audio content will be shared immediately. This feature has a lot of potential if you have an NFC phone or tablet. Sound Mode Options Choices – Excellent Sound Quality! Sound quality from the LA6200 is excellent and a high point worth touting. Clear Voice II and Virtual Surround Plus options here add interesting choices, but our choice is the Cinema setting with Clear Voice II setting enabled with the level set at 3. The Standard setting is our second favorite with Clear voice II enabled. It is better than the other manufacturers we've tested as well by a long shot. The speaker in the bottom back of the TV adds most of the overall depth to the TV but we believe it is well worth it to have good sound from the TV. These minimalist TV designs are often used in spaces without home theater systems. The 50LA6200 has nice clean lines and a half inch black frame. The stand is, um, updated? Kind of bottom of infinity shaped. The 50LA6200 plays big in the value department at around $999. It competes with those pesky plasma TVs like the Panasonic TC-P50ST60, and a few other LEDs that have strayed to the 50 inch size like the Sony KDL-50R550A. Add the magic remote and you have a special TV.